Killer Characters: No Mallets Intended Blog Party & Giveaway! No Mallets Intended Blog Party & Giveaway! There's a strange wind blowing through Queensville, and I don't like it. Folks are bickering and arguing about the oddest things, especially at heritage society meetings! We're supposed to be planning the refurbishing of the former Dumpe House, now the Queensville Historic Manor, in time for the December festival we call Dickens Days. I've always loved Dickens Days, and was excited a few years ago when I started to participate after I joined the heritage society. During the annual December festival we make much of Queensville's Victorian feel and connection to all things Victorian. This year should be even cooler, with the new historic home opening! Or it would be if we could get moving on it! We can't even get people to agree on the right color to paint a parlor wall, much less what to do about the leaky plumbing. It doesn't help that I don't like the writer they hired to whip up a pamphlet on the house, though I like the other guy who tried out for the job even less. But... I wouldn't give up this task for anything, no matter what! I get to work on the kitchen all on my own, and you know what that means: more antique sales and junk shops and auctions! A Hoosier cabinet to hunt for, antique kitchen implements to catalog, including the largest collection of kitchen mallets I've ever seen! It is kind of eerie to be out at the house alone late at night, though, even with Hoppy for company. The whole house creaks and moans, especially at his time of year, with a chill wind blowing up in the attic and outside, sending gusts of dead leaves scuttering around the property. I keep hearing noises, like somebody walking along the second floor hall. A more timid gal would have cut and run, but not me. There is nothing going on of a spectral nature, that I can guarantee you. I always look for the logical explanation, like the house is settling, or the furnace is kicking in. Or... is there actually someone up there, moving around? I hope not. What would they want in an old house anyway? As long as no one gets murdered, I'll be good. I'm trying to convince myself I'm not nervous, anyway. Are you susceptible to fits of the nerves when you hear strange sounds? Jaymie Leighton is excited and a little nervous about her current big venture, completely redoing the kitchen at Dumpe House—now the Queensville Historic Manor—in time for the opening in late November. But the house is mired in controversy, a challenge to the heritage society’s right to own it, and questions about the author hired to write a pamphlet detailing the Dumpe family history and that of the house. But a late night whack on the head with one of the antique mallets Jaymie has been cataloging for the society and a dreadful murder right on the house’s doorstep draws her once again into murder and mayhem. Jaymie faces her most cunning and dangerous opponent yet, but with Hoppy and Valetta by her side and the police chief’s approval, she knows she will figure out whodunit before they do it again! I'm choosing among ALL who comment on this blog entry and giving away two great packages! 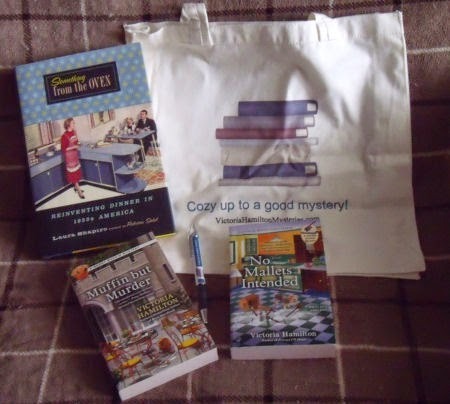 Package 1 will have one set of audio CDs of the first three books of the Vintage Kitchen Mystery series, as well as a paperback copy of No Mallets Intended, a cozy mystery tote and pen. Package 2 will hold the tote, pen, a copy of No Mallets Intended, AND a hardback book entitled Something From the Oven: Reinventing Dinner in 1950s America, a fascinating look at the way dinner preparation and serving changed in that decade. Both packages will have as a bonus a copy of Muffin But Murder, Book 2 of my Merry Muffin Mysteries! So... comment to enter to win WITH some version of your email address! I will choose a first place to win Package 1, and second place to win Package 2. I need to catch up on this series. I've only read the first book. I've read all the books in this series so far and have enjoyed them all. Looking forward to No Mallets Intended. I haven't read the Merry Muffin Series but it is on my "to read" list. I can't wait for the 4th!!!! It's preordered and will be waiting for me on my Kindle when I wake up. Sounds really interesting,I particularity like the cover design! <3 the series! Great giveaway! Thanks for the amazingly generous giveaway—I would love to read this book! I have no idea how I've missed your series so far, it looks delightful. I can't wait to read/listen to it. I'm glad that it's available in audio too! Wow!! What a wonderful giveaway!! I love audiobooks, and the 1950's dinner hardback book sounds great!! I'd love to win either of the two prizes! Just found this series this summer, Love it !!! Can't wait for No Mallets Intended !!! What a great giveaway. I just love your books. How cool! Love your books! I can't wait for this book! Victoria's characters are well developed and believable. I love this series! Thanks for the new mystery..........yippee! This is a very generous giveaway, I love that this series is about vintage kitchens. I am always amazed at people that can create beauty out of chaos, and to do that on a house - amazing!!! Then throw in a mystery, it's all good! Thank you for such a great give away offer. The book sounds awesome - the giveaway IS awesome :D Thanks so much for the chance to win! Wow, great responses! Love the Vintage and Muffin series both so much! I've got the first in the teapot series and a romance on hold for me at my local library! A new mystery writer to try - exciting! I really love the titles of these books - very creative & I can't wait to start reading the series! Yeah a new series to discover! This is an awesome giveaway...THANK YOU! Your books are a treat to read so hearing them read would be an added bonus. Congrats on the new release. Audio books would be great. Received and started your latest. A win of either package would be a great win. This is a series I'm looking forward to reading! Love your books and thanks for having the contest! Lorraine at monstercreed@yahoo.com. Love this series! Wonderful giveaways. I especially like Reinventing Dinner in 1950s since I was a teen then! I've read--and loved--all the books in the series so far, so I'm hoping I can win Package #2. I'm fascinated with 50's cooking--recipes, techniques--everything. Looking forward to reading No Mallets Intended whether I win or not! I'd love to win either package. Love your books! This is such a fun series--and all the old kitchen things remind me of what was in grandma's kitchen. Wow, I would be in paradise to win either prize. The first series covers bering back so many memories of my grandmother's kitchen. And I love kitchen redos! Jaymie always has so much fun going vintage! I'd love to have her kitchen (but maybe not her knack for finding bodies!)!! Hmm, wonder if I could get her to find some vintage treasures for MY house. I love vintage, especially kitchen. I can't wait for "Mallets" even though I know that I'll just start getting antsy about how long I'll have to wait for the NEXT Vintage Kitchen Mystery. I love this series!! My sister and I got all my gram's kitchen stuff, and we have some of the things that are in the books. This giveaway looks fantastic!! I am really excited to start this series! And what better way to start out than with a fabulous giveaway! So exciting!! I would love to win this! An awesome giveaway!!!! I love this givaway! Thanks for offering. I love Victoria Hamilton's books! This is a wonderful giveaway! Thank you! Nice giveaway, thanks for the chance to win. These books sound like so much fun! Thanks for the chance to win. This is a new series for me. I would love to read/listen to it. Great giveaway! Looking forward to reading this series! Oh my! I'd love to win either prize, but if not I'm going to have to pick up "Something from the Oven..." --- what a fun find, and a great prize either way! Limbs, not lambs---thank you Siri! Wonderful giveaway! Great books to read during the fall and winter seasons! Wonderful giveaway! I can't wait for the new book. Excellent giveaway and I sure would love to read these book. I enjoy this series very much. I get the urge to collect antique kitchenware while reading the books, but then it passes. Thanks for the opportunity to win one of these great giveaways. I have not read this series but love your "Muffin" series. Thank you for the giveaway. I would love to win. I definitely freak out when I hear noises. It's even worse, when I'm with my animals and they hear a noise to. It's make me nervous, when you see their ears raised listening. pamrp52@yahoo.com thinks your giveaway is awesome! I freak out at strange noises and have a grandson who loves to play on that fact. He finds strange sounds on his smart phone and puts it so only I can hear it! I just love cozies. The descriptions just draw me in, so many topics I wouldn't otherwise read about. What a great giveaway. Thanks. I love this series!!!! What a great giveaway, thank you! I don't pay attention to the sounds the house makes unless I'm alone - it can be freaky. Oooh! Can't wait to read! Getting ready to plan and redo my own kitchen soon. Bet this story has some great ideas. The new release looks great! Can't wait! thanks for chance to win! Strange sounds can totally freak me out when I'm alone or the only one awake. Especially if I've been watching something scary. That actually happened last night while I was watching And Then There Were None. I've loved all three books in this series so far, have been so looking forward to this one, and hope for many more. Thanks for the fabulous giveaway. What exciting prize packages! That cookbook sounds interesting. I look forward to reading your new book. I admit that I don't like being home alone late at night. Every little sounds makes me nervous. Fabulous giveaway! Love cozy mysteries!! I love reading this series! I've read all of them but enjoy "reading" audiobooks. I often read a mystery (library's copy) and then buy the audio version to listen to on my work commute. I know crazy, right? But some series are that good! And this is definitely one of them. Wonderful giveaway...both packages. But I'm partial to #1. Congratulations on your newest release. Such an amazing giveaway! I love both of these series as well as your teapot series under your other pen name. 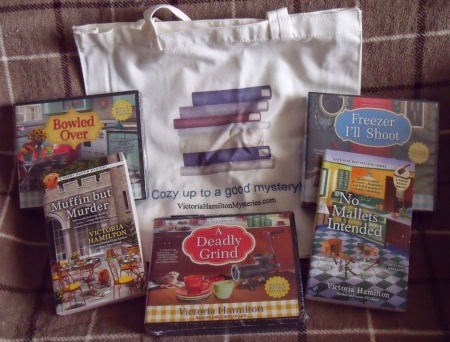 Thanks so much for gifting us all with such lovely cozy mysteries! I've read the first in this series and loved it. The audiobooks would be wonderful! Great prize packages. :) Thank you so much for the chance, and for writing such fun cozies! Read all of your books in all of your series. Would love to win one of these prizes. Noises that go bump in the night don't bother me. However, when my kitty starts watching those invisible things move around the room ... well ... that's what bothers me! I love cozy mystery series. I have many that I am involved with. I plan to add this to my list. Both packages sound great! Thanks for the opportunities to win. These books sound like an awesome series to get hooked on! Thanks for hosting such a great giveaway!! My comment disappeared. So I hope this is not a duplicate. I have not started the series but would love to. I do get nervous when I hear noises that I am not sure what they are. Thank you ALL for such a wonderful response! I'm choosing the two winners today, and I will email them! I have read all three of the books in this series so far! I love them! Thanks for the awesome contest. I love that this book is a christmas time book, because some authors who have been releasing books aren't going the christmas route sooo thanks! Swag would make my day but your books on audio smashing gift. Great giveaway! Thank you. Also liked & shared your page. Unknown noises at my house make me "jumpy". Love this series! Thanks for the chance to win one of these great packages. I have not read this series before but it sounds fun. jenne.turner(at)unt.edu please remove the parentheses - thanks! Jaymie, I want you to know that I consider myself your friend. I've been at your side for a few years now and I will be there as long as you so wish. We have a lot in common. I, too, live in Michigan. I'm not fortunate enough to live by Lake St. Clair, but I visit the area every chance I get. (There's something special about being by the water, isn't there?) Like you, I also love to cook. I don't have a lot of vintage kitchen equipment, but I. myself, could be classified as "vintage." We're alike, too, in our love of reading, but mysteries are a bit more to my liking than romances. And finally, like you, I do get nervous when I hear strange noises in the house. My advice to you is to trust your instincts because they've served you well so far. Above all, be very careful. I surely don't want to lose a friend. Thank you for the giveaway. I really enjoy the series, & look forward to the new book. Thank you for the giveaway. I have enjoyed the series, & look forward to the new book. my imagination tends to go wild at strange sounds, especially after watching shows like "Ghost Adventures" and "The Dead Files." 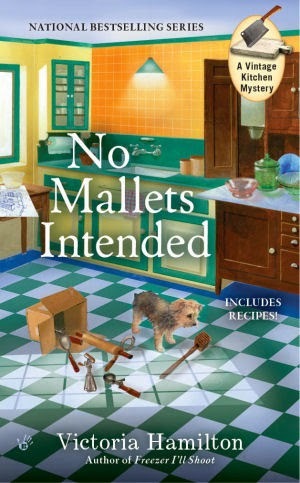 I have already secured my copy of no mallets intended. I have thoroughly enjoyed the author' series'. Would like to win either bundle. Think your mysteries are terrific.